It’s hard to imagine that the effervescent Indrani Kopal was once socially crippled by poor English. Or that the dark-eyed 36-year-old with long wavy tresses was nearly bald by her late teens. On the other hand, it was probably these personal demons – or rather, her struggles to slay them – that enabled her to make one of the recent most critically-acclaimed documentaries to capture the rehabilitative power of dance. Produced on a budget of USD3,225, filmed using school equipment and edited on a Macbook Pro that she defaulted on one semester’s worth of tuition fees to buy, The Game Changer – her award-winning documentary about the rehabilitative power of dance – won the best student documentary award at the 2015 Cannes Film Festival. 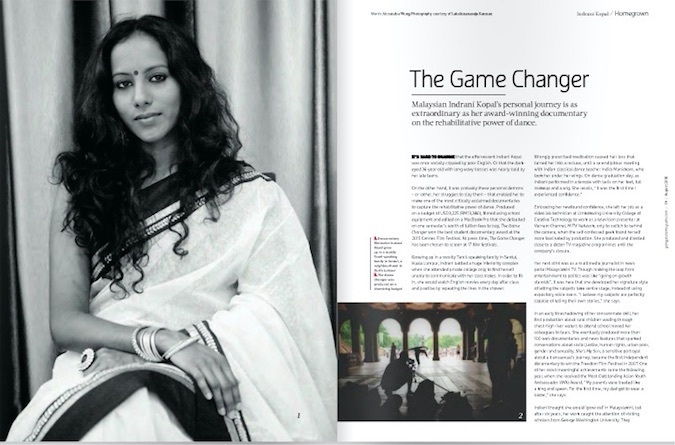 Like most Malaysians I knew of Indrani through a Star article which highlighted her extraordinary achievement: At press time, The Game Changer has been chosen to screen at an unprecedented 17 film festivals. I knew she was someone exceptional, and when I met her in person for the first time in June, it set the record for my longest interview ever. Because there was so much we had in common, so much to talk about, and because she is so darn funny. You can also sense why she’s so good at her job – she tells stories with such cinematic clarity that you feel you are in her shoes. Her personal journey is every bit as extraordinary as her work, and the people she documents in her work. My story ran in the August 2016 issue of Going Places.